When I read today’s prompt asking if we are on a first name basis with an inanimate object, I thought of Marion. She’s behind me right now, always set up and plugged in because I’m going to sew something……soon. I have a nook at the end of the hallway for my computer and Marion with a wheeled chair that floats easily between them. The computer is just a computer, no personality whatsoever. The original Marion was my mother-in-law. Years ago I called her Brunhilda but since she has passed and I have aged, I’m not so hard on her. The only reason I mention it is that it describes her easily and succinctly. It was in her will to leave me the sewing machine and all of her sewing stuff she’d collected for 40 odd years which was very surprising as she had two daughters. I feel honoured to own it. It/she is a Singer from the 1970’s built into a wooden cabinet. It’s heavy metal and runs like the well-oiled machine she is. It’s beige, big and solid….. just like Marion. My mother-in-law kept everything she might be able to use again; trims, sequins, even bra hooks saved up in a little plastic container. The gold thread on the right in the photo is from a vast collection of threads on wooden spools from as far back as the 1940’s. I rarely have to buy thread as there are so many colours and shades.There are gadgets and gauges that I can’t figure out. There are three buttonhole attachments used on machines that came before her. One each from the 1940’s, 50’s and 60’s; all in their original boxes with the instruction books and they still work on this machine. She was meticulous. Sometimes when I’m sewing I’ll talk to her; “Hey, Marion, how about that son of yours? tsk,tsk! 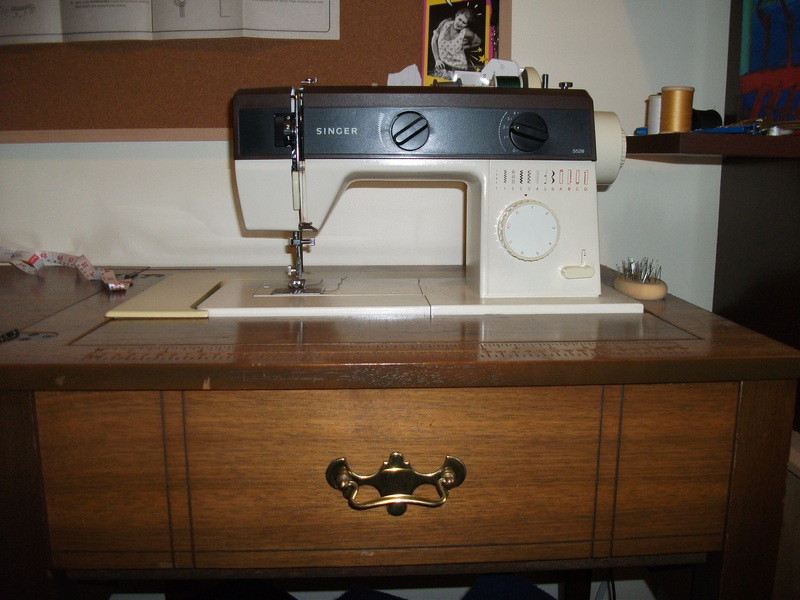 !” She would not be happy we broke up….. and I probably would not have gotten her wonderful sewing machine if she’d known!